Off the Wall Steampunk Cosplay « Adafruit Industries – Makers, hackers, artists, designers and engineers! Cosplay projects run the gamut. They can be labor intensive and use multiple materials and take a long time to craft and/or they can be so creative they have to be noticed. What I’m trying to say is a cosplayer doesn’t have to spend weeks or months on a costume in order for it to be noteworthy. Case in point: this creation by Redditor 1stCenturion. He took the popular steampunk cosplay trend and put a spin on it that I’ve never seen before. 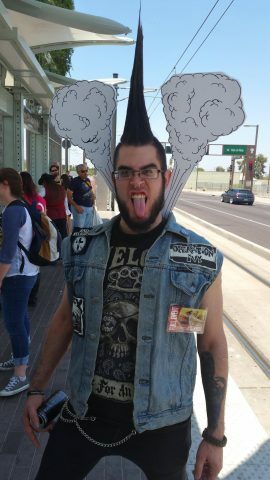 1stCenturion put together a punk clothing ensemble, styled his hair into a mohawk, and added puffs of steam over his shoulders. It’s ridiculously clever.